Modern ski home at the base of the Brighton Ski Resort. Just a two minute walk from all the base lifts at Brighton Ski Resort. 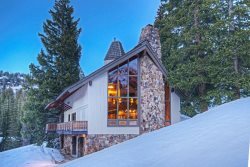 This spacious private home with vaulted ceilings on main floor has stunning views of the Brighton and Solitude ski areas. Lots of amenities including hot tub, gas grill, satellite TV, washer/dryer, wifi, and extra off-street parking. Sleds, games and puzzles are available for guest use. Perfect for families who want easy access to the lifts with privacy and spaciousness. Free WiFi and onsite Washer/Dryer. Everything was perfect. I would recommend this place. This place was outstanding, we read the description and had questioned if it was truly accross the street from the chairlift, well it is! It was super convenient not only the lift but unloading and loading our ski equipment and luggage along with the groceries we purchased on our way up the mountain. A big thanks to Carole for her recommendation for a massage...Sasha was great and having her come to the house was convenient! The house was actually more than we expected, clean, comfortable and the hot tub was small but a great way to end a long day of skiing/board. The entryway was big and was convenient to store all our equipment. We will be back next year this location was great!